There is visceral magic in an excerpt from “Second to Last” when five couples appear to glide on ice. Alejandro Cerrudo’s fluid exploration of duets is marked by slides and lifts to evoke skaters on a frozen pond. Instead of skates, they wear slippery socks. Set to adored and familiar music by Arvo Pärt, “Spiegel em Spiegel,” the work was one of four presented by Hubbard Street Dance Chicago at the Spreckels Theatre on Saturday. In “Second,” Cerrudo, the company’s resident choreographer, focuses on gliding phrases and pleasing transitions from the wings. Michael Korsch’s lighting design suggests a winter sun setting on a forest. Cerrudo’s performance in “Wendy Whelan — Restless Creature” last January was a big success. His thoughtful critiques charmed dance makers at CHOREOLab2015 too, which sparked La Jolla Music Society to invite the attractive Hubbard troupe for its Dance Series. Three more dances were also slippery and full of windmill arms, but instead of a burst worthy of Spring, the program ended with an overly long and depressing piece with snow. 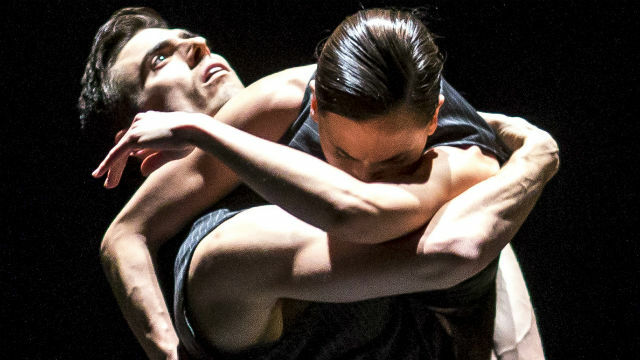 Most intriguing was William Forsythe’s masterful “N.N.N.N” with four dancers rebounding and creating a percussive score of breaths, grunts and whoops. A simple arm swing sent bodies into seamless, rhythmic tangles. The playful tone was exhilarating and showcased a talented company. Perhaps Forsythe imagined rowdy siblings wrestling or couples arguing while stifling voices. Men and women entwined and repelled with impossible ease. How did they learn these endless phrases? There was extra irony when the audience of music savvy patrons cheered for this loose-limbed dance set to quirky raspberry sounds. In “Out of Keeping,” by Penny Saunders, graceful dancers in jewel tones slid from left to right and seemed overpowered by a couple in gray. Imagine throw pillows on a sofa coming to life. Michael Mazzola’s lighting cast shadows on the wall, but the work needed variations in staging and dramatic bursts. The icy cold dance with men and women struggling to survive had a World War I edge. Costumes by Pite and Joke Visser suggested soldiers, but up close we saw pinstripes and office sabotage. Jerky poses and music by Brahms added the melodramatic vibe of a silent film. Stranger still was the flickering snow projection on the back wall. The snow FX and dancers were mesmerizing, but to the point of seizure. In the end, a body was left in a sprinkle of snowflakes on the stage and it felt wrong to applaud. Kris Eitland is a San Diego-based writer and critic. This article originally appeared in San Diego Story.